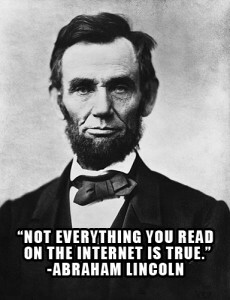 Internet Gullibility: Don’t Spread the Dumb! Being in the biz, I’m on social media sites a lot. I mean A LOT. As a result, I see the whole gamut of hoaxes, scams, “like” bait… you name it. The Internet has given tricksters and scam artists the power to reach millions of people though one click. Unfortunately these posts are being shared by too many – which leads me to the main reason for writing this. I’d like to make an appeal for everyone to stop being gullible and spreading this garbage. Just stop. I understand you’re overjoyed at Malaysia Airlines Flight MH 370 being “found” or saddened by the latest celeb demise. I know you really want to help that kid with (insert disease here) with all your “likes” or get free money from Microsoft (yes this is still going around). But really, please take two seconds to double check the facts before you spread the dumb. Most of the time, you can simply review the URL and determine if the story is legitimate. Please know that a site with WordPress or GoDaddy in their URL most likely won’t be dispelling factual or official information. “Like” Farms are scams solely built for Facebook. What happens is someone creates a fake page and starts posting bait (things to get you to interact with posts). When you like something on Facebook, it shows up on your friends’ news feeds. The more likes, the more visible the item is on the platform. Once that page administrator has reached thousands, even millions of likes, they begin to sell ad space or put the page up for sale to the highest bidder. This scam also includes those silly contests supposedly from Southwest Airlines, Disney Cruises or some other corporation. First, companies are not allowed to host contests on the Facebook platform. Second, if a company chooses to violate Facebook policy, their page will be deleted. Third, it’s easy to duplicate a brand on a social site for personal gain – logo and all. And finally, if these contests link off to a separate page they are possibly exposing your computer to malware and THAT, my friends, is a whole technical can of worms. So no, don’t trust or “like” those links either. Recently Facebook has been cracking down on “Like” Farms and is discouraging users from sharing the same post repeatedly and ask for “likes,” comments or shares. These are typical behaviors of “Like” Farms and I applaud them for attempting to clean it up. Nothing irks me more than fake stories spreading false hope or instilling alertist fears. This includes the so-called “Big Hospital Finally telling the truth about cancer, Johns Hopkins” story and the fear-generating radiation from Japan reaching the U.S. There are heartless individuals out there who play on emotions in order to get visits to their blog. The more visits, the more traffic. This means more ads they can sell and more money they can make at the expense of your well-being. Shaking your head yet? What Do I Do If I Share The Dumb? Google – Simply search for the story title to see what else pops up to see if it’s legit. Snopes – Cut and paste the title of the article in the search bar and click GO! Facecrooks.com – Notifies you of scams, schemes and tricks on your favorite social site. Urban Legends/About.com – Keep up-to-date with this handy list of the latest phony baloneys. Phew. Glad I got that out. Now I’m off to kick the lid off more Internet fallacies. Wish me luck! Have more questions about the dumb? Fill out our contact form and we’ll do our best to give you more tips and resources. You can also give us a call at (915) 351-8440.